Hey there quilty friends! Welcome to my stop on the Quiltmaker's 100 Blocks Volume 16 Road Rally blog tour! I'm absolutely thrilled to share my block, Centrifuge with you. It is in the pieced blocks section, and since they are arranged alphabetically by author, my block is at the very end and super easy to find! If you are familiar with my patterns, you know I love designs that have rounded elements mixed in, and blocks that create fun secondary patterns. I definitely kept those features in mind when I designed this block. The block itself is made with basic piecing techniques, but when they are put together, they create some wow factor. In this block, I used Kona Bluegrass, Navy, Pond, and White. My original block in the magazine used Cloud 9 Cirrus Solid in Rain instead of Kona Pond, but when I got around to making my quilt, I couldn't get ahold of anymore. Kona Pond is the closest, and it is a great match. Since green is my favorite color, I let it take center stage in the block. I love how fresh greens make me feel energized, while softer greens are so calming. If sewing the snowball corners for the Centrifuge block seems daunting, take heart! To keep your stitch line straight, many people recommend drawing a diagonal line across the back of your square as a guide. I really hate this step, so I don't do it! Instead, I use a piece of painter's tape aligned with my needle on my machine and table. 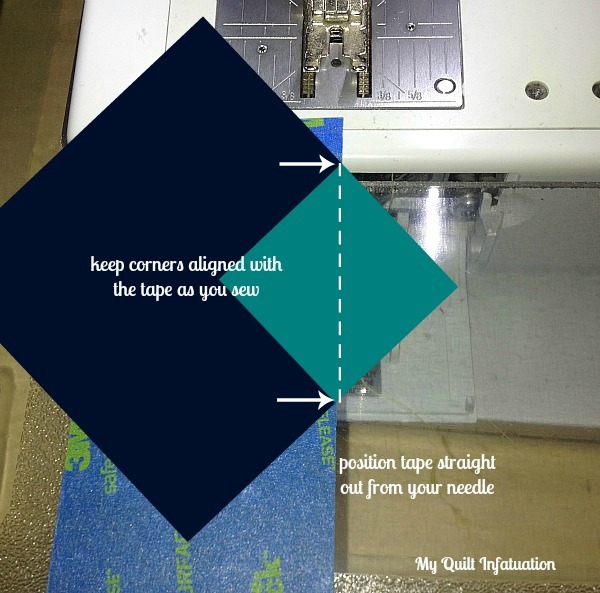 You can keep the corners of your square in line with the edge of the tape while you sew, and know that you're sewing a perfectly straight line every single time. You'll zoom right through those corners in no time, with absolutely no line drawing. 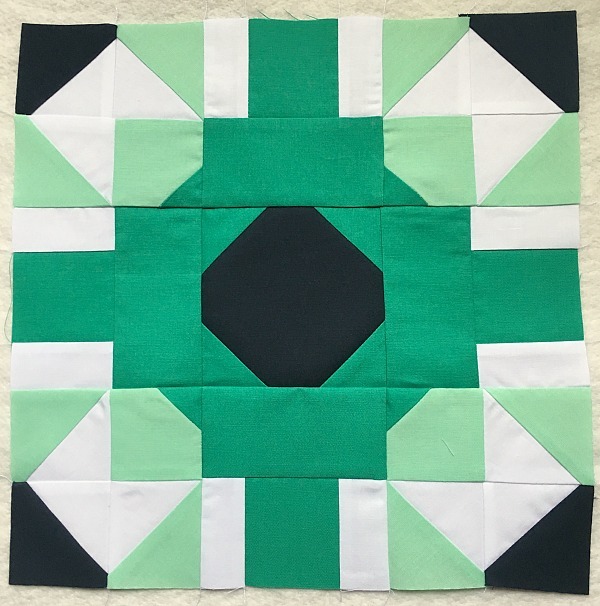 As shown above, the Centrifuge blocks can stand alone to make a lovely quilt, but when I actually got down to making my quilt, I decided to play around and add a secondary element with pieced sashing and cornerstones. 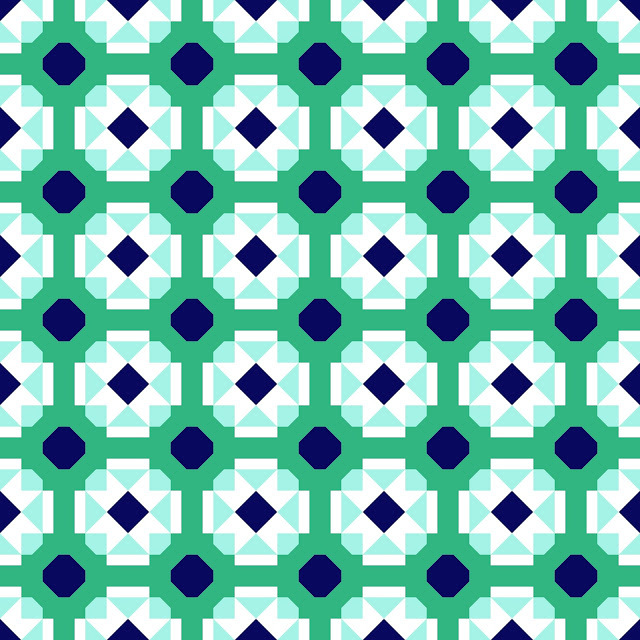 The pattern created reminds me of the intricate tile work seen in beautiful historic buildings, and I think it would look equally striking in prints as well as solids. 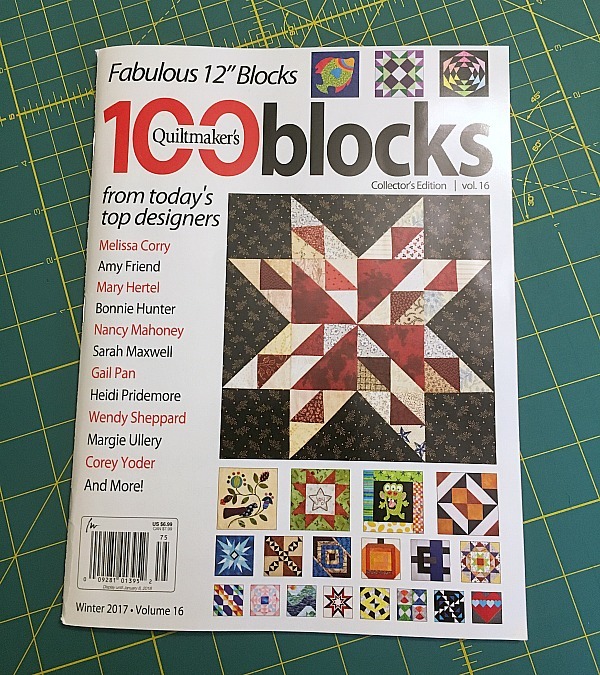 I hope you'll check out the amazing lineup of blocks included in the current issue of Quiltmaker's 100 Blocks, Volume 16. I've already had the pleasure of thumbing through to see the wonderful array of creativity in the blocks, and I know you'll find lots in there that you love as well. You really rocked the secondary pattern thing on this one! Love the block, love both settings. Great work! I LOVE your block Kelly! It looks so awesome in the quilt. Congratulations! Wow! Great block and I love the design when all the blocks are put together! Your block is beautiful. And I really love the quilt that is sashed. It does indeed look like tile! This is such a pretty block and I love the secondary pattern. It's going to be fun to play with this using solids and prints, etc. I need to go find the magazine! Great block! Love the secondary design from putting the blocks together, both with and without the sashing! I think you have to love Green because your name is Kelly....and that was one of my dad's favorite colors Kelly Green. So pretty and I love your color choices. Gorgeous colors--and thanks for the sewing tip! Beautiful block and I love the secondary pattern it makes. Great block, blue is my favorite so I'd use it. Your block is striking! I would love a floor with that tile pattern in browns and neutrals! Awesome block! Thank you for sharing! Enjoy your day!! I am trying really hard to win a copy of this magazine now. It comes down to either winning or actually buying one. I just love your block so much. I enjoy secondary designs and also the idea that this block also reminds me of intricate tile work. Thank you for being a part of the Road Rally Tour and wishing you Happy Holidays. Congrats on your block, especially love it with your sashing and cornerstones you added. Congrats on being part of Volume 16!! Nice block! I love how it looks when multiple blocks are put together! That is a Wow block, those colors looks stunning together and look at the secondary patterns. Yeah for getting it in Quiltmaker 100, I will find it, and make it. Thanks. Love how your block looks made up in the quilt. Thanks for sharing your fabulous block. The patterns created are certainly versatile. Love everything about this quilt - both patterns! Will you be putting out instructions for the quilt with the sashing and corner stones? Congratulations on your block! I love the secondary pattern in your layout. Thanks for sharing. This is great. I love the addition of the sashing. Striking. Great block; I love the look of tiles! Lovely. And thanks for the tip on snowball corners. Great block! A variety of blocks by just changing color, and value. That's a handy tip about the painters tape. That would save a lot of time not drawing the diagonal lines! 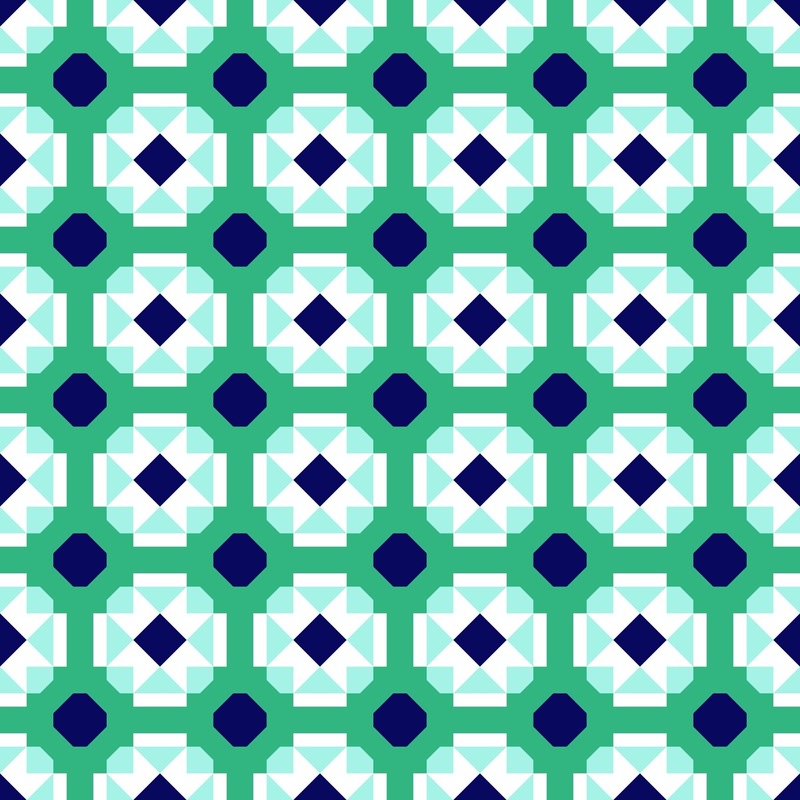 Lovely block, you design things with such great secondary patterns. Your block creates such a secondary pattern, that pattern looks like it's the main one. Great block. Wow, dry cool block. Thanks for sharing a variety of layouts/colors. What a cute block...minty greens are so refreshing. I really like your block. Thanks so much for sharing it. Your block makes a beautiful quilt. Your block(s) and quilt are seriously beautiful! Wow, it's really an eyeopener seeing your design go from a digital image to a photo of the quilt. I was thinking that it was too complicated for me until I scrolled to the photo. Now I want to make this quilt! It's lovely. Fantastiv.The secundary block caught my eye!! Great job! I love how the full quilt turned out! The colors are just lovely! :) I am hoping to work on a block or two to submit soon. Tiling is exactly what I thought of when I first saw your block--beautiful!! 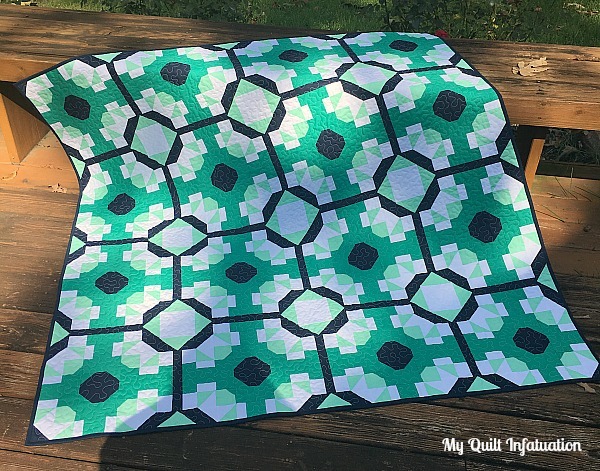 Seeing your block made into the full quilt was enough to make me want to get to work--it does look just like tile work, and that is one of my favorite quilty inspirations. I love your design - it does pop! Beautiful block, I love the design. Great block. The finished quilt really does look like ancient tile. Thanks. Congratulations on having your block included in Quiltmaker’s 100, Vol. 16! What a beautiful block and the first thing I thought of was a tile floor. Love it! Great block that makes a very striking quilt! Congrats on being in the book again. I love those same colors. Love the calming greens. Isn't it funny how just a little piece of sashing changes the whole look of a quilt? I like it with and I like it without. Great block! Thank you for your giveaway. Very pretty colors and a great block! Great block, green is one of my favorite colors. Great block. I wonder if it would work with scrappy, but same color types in each section. Hm, I may have to try it. Thanks. Wonderful block. Before I read all the way through, I though Italian floors! Great to know tile work is where you were heading. Congrats on being accepted again. Your quilt block can make some amazing quilts. Great job! Your block is really pretty and looks amazing made into a quilt. I always love it when there is a secondary design in a quilt. Love the look of this block and like the "tile floor" layout option best. What a cute block and layout options. Thanks for sharing. Cool block! Love the way it looks like a tile floor when put together. Thanks! Great block, I love how it looks like the tile floors. Wow factor is right! Amazing secondary patterns and tile work. I love the graduated greens! I definitely want to make this quilt! Please make a pattern for it, or share yardages and cutting. This is sparkly! I love your block and the secondary patterns that it create. nice block. Your right, the quilt it produces does look like a historic tile floor. Nicely done. I love your block! The name is great, too. Nice block! Green is my favorite color as well. I like the name of your block! I've been working on my own green quilt~ Loving working with it! Wow factor is right! This makes an awesome, so very cool, quilt! I admire how your mind works! Congratulations on the block. It's awesome. love this along with all your blocks-I follow your blog ! Great block Kelly! I love the patterns that are formed when putting it together and the colours are very eye catching!